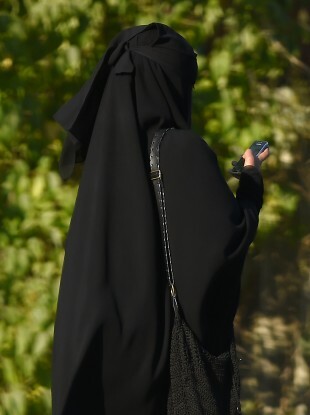 File photo of a woman dressed in a burka. THE MAYOR OF Cannes has banned the wearing of burkinis – full-body swimsuits – on the beaches of the French Riviera resort famous for its annual film festival, officials said yesterday. Mayor David Lisnard signed off on the ruling that “access to beaches and for swimming is banned to anyone who does not have (bathing apparel) which respects good customs and secularism,” which is a founding principle of the French republic. Beachwear which ostentatiously displays religious affiliation, when France and places of worship are currently the target of terrorist attacks, is liable to create risks of disrupting public order (crowds, scuffles, etc.) which it is necessary to prevent. Thierry Migoule, head of municipal services for the town, sought to clarify the ruling’s intent. “We are not talking about banning the wearing of religious symbols on the beach… but ostentatious clothing which refers to an allegiance to terrorist movements which are at war with us,” he said. On 14 July the nearby Riviera city of Nice was the target of an attack claimed by the so-called Islamic State group which killed 85 people, when a truck ploughed into seafront crowds celebrating the French national holiday. Migoule said that no burkini had been seen on any beach in Cannes since the ruling was signed into force on 28 July by Lisnard, a member of the centre-right Les Republicains party. Earlier this week, a water park in nearby Marseille cancelled plans to host a private event for Muslim women wearing burkinis after they sparked outrage, including from politicians on both the right and left. Email “The mayor of Cannes has banned the wearing of "burkinis"”. Feedback on “The mayor of Cannes has banned the wearing of "burkinis"”.